Scrip cards are still available during the summer. Check below for details. Scrip is an important, continuing fundraiser for St. Thomas School. Scrip is a program that allows you to order gift cards from hundreds of stores and restaurants. 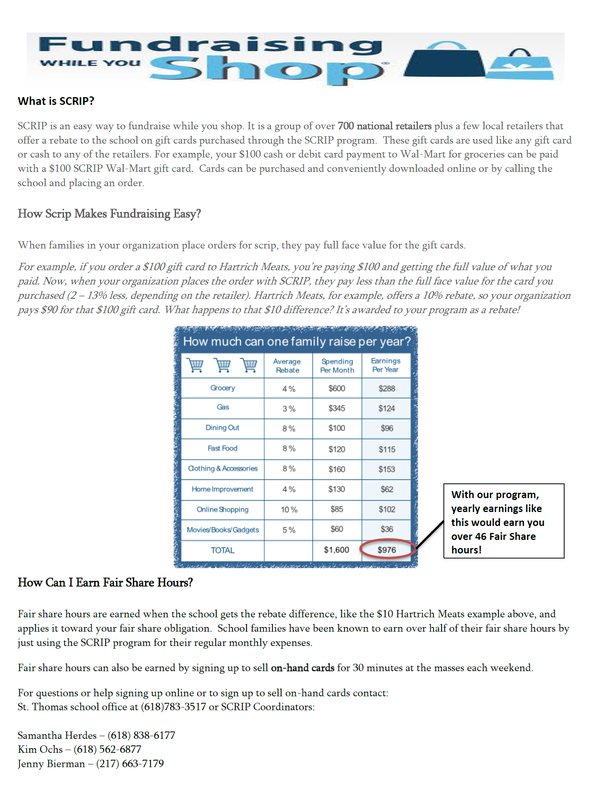 You pay the face value of the cards, but the school purchases them at a discount, thereby receiving a donation from the business for each card. This means the cards cost the purchaser nothing extra, but the school makes money. To print an order form, and to see a list of some stores and restaurants in the program, click on the Scrip Order Form link below. For the entire list, click on the link below or go online to www.glscrip.com. We have a number of cards available for purchase at all times in the school office. Cards are also available at Masses and ballgames. Click here for a list of On-Hand Cards. Orders must be turned in by 1:00 pm Monday afternoon or placed on-line by 6:00 pm Monday evening. Cards are available for pickup on Friday afternoon. ﻿Shop with Scrip.﻿ If you prefer to place your order online through the Scrip website, you must set up an account. Follow the directions in the link at left. ﻿Great Lakes Scrip. ﻿ Click on the link at left to go to the Great Lakes Scrip website where you can find a list of all merchants participating in the Scrip program. SUMMER SCRIP ORDERS: Scrip orders are handled differently when school's not in session. If you use the Scrip Order Form above, your orders should be deposited in the blue Scrip box in the church or given to one of the sellers at masses. (Cards are sold after the Saturday evening mass and between the two Sunday masses.) Orders will be picked up over the weekend and placed on Mondays. Cards will be ready to be picked up at masses the next weekend. Other arrangements for pick up can be made by contacting the school office.